I first made New Look 6225 last summer, in a lightweight cotton lawn. I have actually worn the first version of this top quite a lot. I like the longer length and the comfortable fit. Some of you may recognise this floral print silk charmeuse from my Vogue 8998 dress. Interestingly enough, I STILL have not had an occassion to wear this dress. Sigh. Maybe for my birthday this year? Anyway, I had just enough left of the silk to cut the front panel and the back, although I had to add a centre back seam to facilitate this. I did not even consider print matching. The sleeves and bias neck band are cut from black silk charmeuse. I did not realise how hard it is get a nice finish on a silk charmeuse bias band. I unpicked the first attempt and tried a second time (probably resulting in some stretching of the band), but I have to live with it. I love the feel and the print of the silk too much for this to be a wadder. The only change I made to this version was to move the bust darts back to their original position (in the first version I had moved them down far too much) and I used the instructions from the True Bias Sutton Blouse to finish the side seams and hems. All the seams were french seamed, but the side seams were finished on my overlocker. Despite the neck band I love this top. Throw it on over a pair of jeans and I feel dressed up enough to go out for an evening meal or drinks. I am also planning on sewing a midi length satin skirt soon and I think it will be great tucked in to that too. Once I have had enough cocktails I won’t care about the neck. Hic. 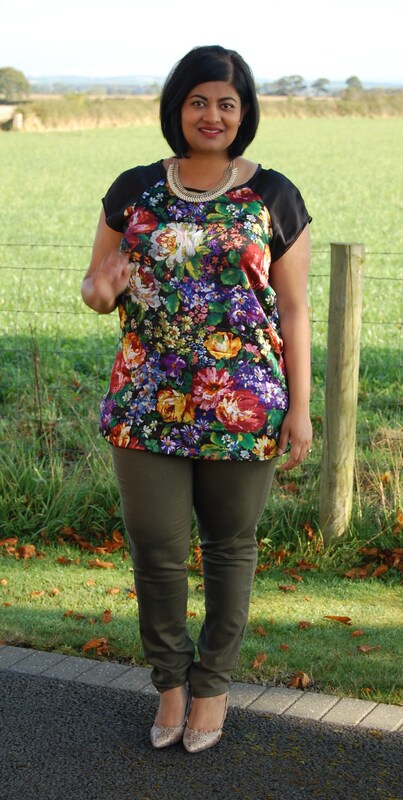 The black sleeves and neckband really set off the gorgeous print. Looks great with jeans, but I think it would be lovely tucked into a black satin skirt. Thanks Sam. I have seen some satin skirts in Coast which I totally think I could make myself so that’s the plan! I LOVE this top. The print and colors are so lovely. It looks great on you, too!! This is a beauty! I love the colour, the cut and the fit. I would absolutely wear this with skinnies or with smart bottoms for work. Lovely job! Thanks Rachel. Yep I think this is a simple pattern that showcases great fabric. This is fantastic! What a great use of print. I really like it! Who cares about the neckline. This is just gorgeous!!! Thanks nakisha. If I even see a dark floral fabric I am all over it!! Love this top so much. 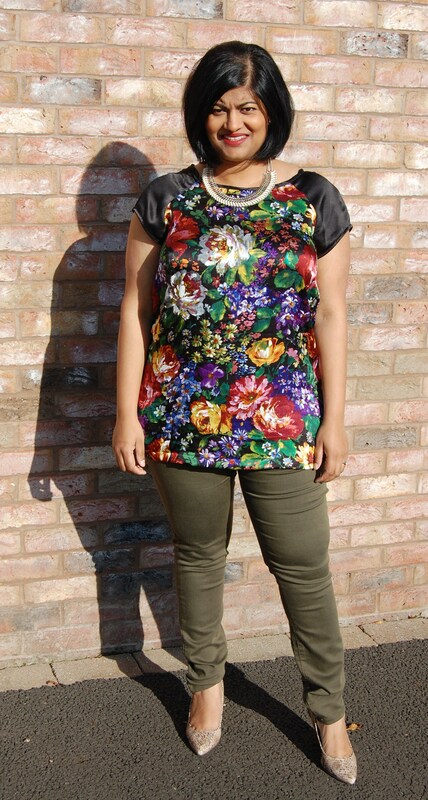 The black contrasting sleeves and neckband really make the floral print pop. Gorgeous! It’s beautiful, the peint looks great with the dark accents. I am a perfectionist, but I don’t always have the time/skills/resources to execute everything to perfection. So as long as it’s not too obvious (that usually means if non sewers don’t notice it) I’ll just gwt over it and wear it as it is. 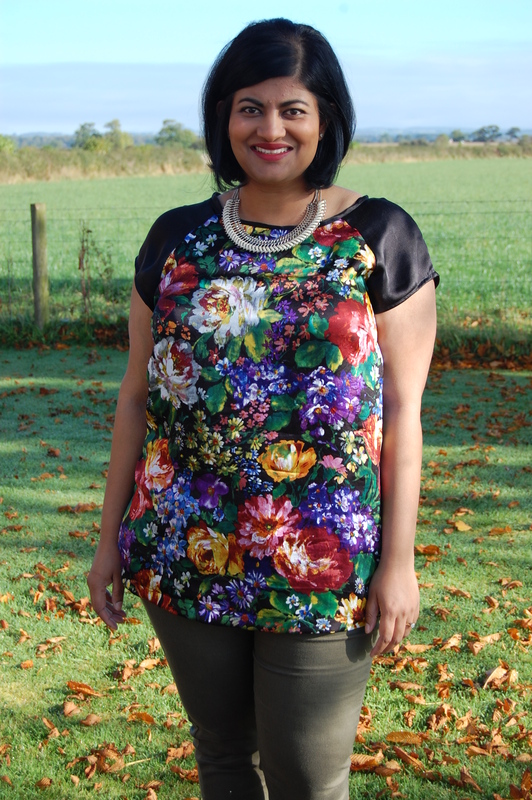 Gorgeous make and beautiful fabric Manju! 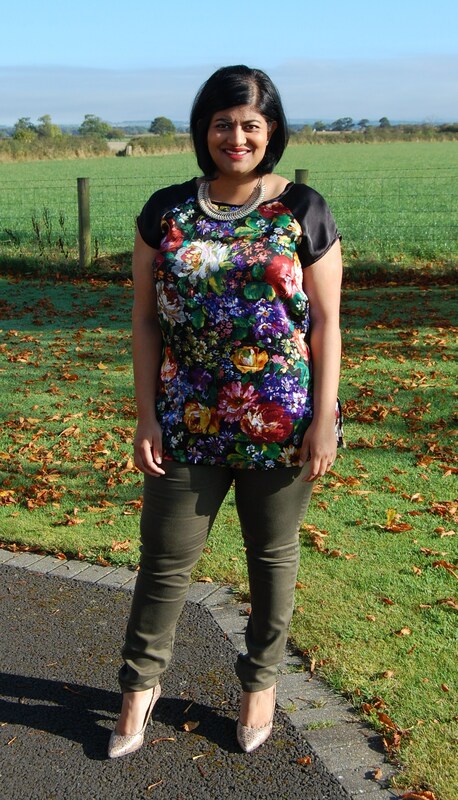 Oh I absolutely love, love, love this top. The vibrant bold colors look so pretty on you. Very feminine beautiful blouse that makes a bold statement as well. Gorgeous!